This week, National Dance Company Wales are showcasing not just one but two works by acclaimed choreographers at Dance City in Newcastle. The pair of performances kicks off with The Green House, developed by the dance company’s own artistic director, Caroline Finn. It’s Finn’s second theatrical work for NDCWales and presents an intense, melancholic but also romantic vision performed both as solo dance pieces and as duets. Focusing on what happens when we prune ourselves (and our lives), Finn takes us on a journey inside a twisted TV set, which is on the one hand nostalgic but also confronts us with the reality of who we really are. Israeli-born choreographer Roy Assaf is then set to present his provocative yet sensual ensemble piece, Profundis. First performed as part of a short tour by NDCWales last year, it’s Assaf’s first work to be performed in the UK, and features a distinctive and exotic soundtrack from internationally acclaimed artists Umm Kultum, Leonard Bernstein and Alva Noto. Profundis is set to challenge how we interpret the meaning of the work that we both make and see, casting a critical eye over the very notion of perception. 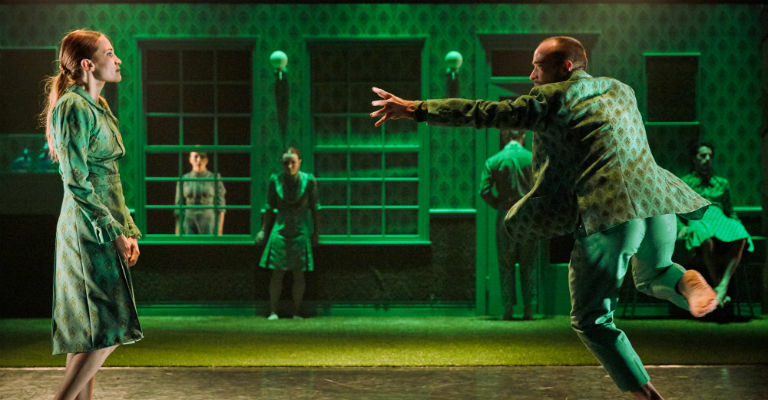 Thought-provoking, energetic and sometimes even witty, The Green Room and Profundis will challenge what you think you know about dance. And maybe the world. The Green House/ Profundis comes to Dance City in Newcastle on 18th March (8pm) and 19th March (2pm) 2017. For more information, visit the Dance City website.